As reported over on TreeHugger, the sap of Acer saccharum actually might be useful in the development of biodegradable bioplastics. Not quite a sustainable solution, but perhaps a step up from petroleum-based technologies. Plus, it goes better with pancakes. If you've read my work over at Yelp, you know I'm a fan of Edgewood Park & Natural Preserve. And today there's great news for the park and its friends: as reported by the San Mateo Daily Journal, "The checkerspot butterfly is flying back from the brink of extinction and making its home once again in Edgewood Park — a decade after it disappeared from the San Mateo County natural preserve." Part of the reason I'm so excited over something so small is that the return of this native species is due pretty much entirely to the efforts of volunteers, who spent years removing invasive ryegrass and other weeds and replacing them with native plants the checkerspot needs for food. That people can — and would — change the world without the motivation of money gives me hope . Again — am I beating this drum too much? — here is an illustration of the importance of native plants. In our case, the checkerspot mommies lay their eggs on California plantain, an unassuming little thing notable for two reasons: one, it is a primary food for checkerspot larvae; and two, it has adapted to the austere, even toxic, soil created by serpentine stone — with which Edgewood Park is rife. When the ryegrass moved in, it forced the plantain out… and the butterflies followed. The recent debate over at GardenRant about the virtues and vices of artificial turf has kicked into high gear a project I take very personally: developing my own yard. I've taken my own advice and lived with the place as-is for a full year now: observed the way the seasons play with the land, taken my time developing a design, and wonder of wonders, not adopted too many orphan plants without digging the holes first. But of all the decisions I've had to make, the play lawn is the hardest. One point conspicuously absent from the GR discussion is the suitability of artificial (or for that matter natural) turf as a play surface for children. Glib comments such as "If you can't grow a real lawn, give it up and move to a condo! ", "I say ditch the whole lawn thing and plant lettuce," and "I'd rather have no lawn than a fake one" obviously were written by folks who don't have active children. Much more sensible are the perspectives of Bay Area designer Michelle Derviss and avid plantsman Max W, who deftly points out that "What most people from summer rainfall areas fail to realize is that a lawn is a priori artificial in the rest of the country. Of course, all lawns are by definition artificial whatever the local rainfall patterns because they only exist by human intervention -- artifice." But I digress, which is emblematic of exactly what I've been doing with our own yard: doing everything except pulling the trigger on natural or artificial. A biosystem and water bills? Or conservation and petrochemical manufacturing? According to the Irvine Ranch Water District down south, a typical installation of about 750 square feet of synthetic turf — yep, that's me — "can conserve approximately 22,000 gallons of water per year." Holy worm castings! The UC Davis Lawn Watering Guide confirms it, and at my current utility rates, that's about $1350 a year. Probably because artificial turf is a newer invention, there tend to be lots of these sort of statistics available touting its advantages. I figured the Turfgrass Producers International would be equally biased in the other direction; but unfortunately, the strongest doubts they can cast on their competition run along the lines of, "What gases would be released into the atmosphere in the event of a fire on the artificial surface?" and "What are the health concerns related to the ingestion of ground rubber particles that takes place from sliding face-first on the surface or dropping and re-inserting a particle-covered mouth-piece onto the field?" OK, I'm being a little rough on the TPI guys. But seriously, why aren't there any objective comparisons out there? Perhaps it's because neither product is objectively better than the other, only better for you. Assuming you need a turf area, is the only suitable location in shade? Is the artifical turf you're considering made with recycled materials or new? Does it require crumb infill? What kind? How much water will living grass require in the same location (and don't forget the electricity for holding those irrigation valves open, and gas or electricity for the mower, and fertilizer)? And so on, ad infinitum. Obviously I'm not as well informed on this issue as I should be. So as I continue my education, you'll be the beneficiary. Of course, if you can shed any light on this whole damn quandary, please (please!) feel free. Africanized Bees, Fire Ants… Earthworms?! It sounds funny, even if it isn't. The New York Times reports today that earthworms — usually thought of as the garden's helpers — are overpopulating and overfeeding, threatening woodland trees, forests and shade plants in the Northeast and Midwest U.S.
"The worms are also breaking down organic matter so quickly that the nutrient overload is injuring plants and running off into streams and lakes. Invasive plant species, like stiltgrass and garlic mustard, which thrive on heavy nitrogen, then move in." Damn. It's always something, ain't it? Over at The Daily Dirt, Heleigh Bostwick advises gardeners that one way to get native plant species into your garden is to "take charge of your landscape. Instead of letting the contractor or designer decide which plants use, you be the one to decide what gets planted. Taking charge can be as simple as asking whether a plant is native or exotic and opting for the native plant, or as complex as researching and compiling your own list of native plants for the landscape designer or contractor to use." Granted, I've got a bit of a bias here. But with all due respect, the whole reason to hire a designer is because our expertise and experience allows us to develop the plant palette that is uniquely suited to your unique wishes and site conditions. If the average homeowner just went to the nursery and grabbed a bunch of native plants because they're native, well, I doubt the results will be spectacular. Will your soil support a native community? Are the plants you've selected even members of the same community? As I've mentioned before, natives are native because they've evolved to a very specific set of conditions. 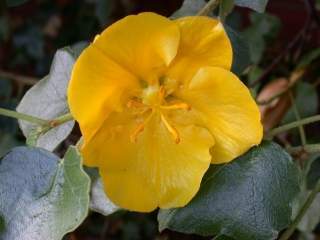 Woe to the gardener who tries combining a Fremontodendron with a Sisyrinchium. Heleigh is right: taking charge of creating the plant list is one solution. But it's not the best one. The best solution is to interview landscape designers (or contractors) extensively. Get references to projects that are comparable to yours. Ask to view sites first-hand. If you're afraid they might just be recycling the same plant palette over and over again, ask whether they have a "favorite set of plants" they like to use -- any answer other than "it depends on your unique situation" probably is not a good answer. If natives are important to you, make that one of your defining criteria for hiring a professional. But do hire a professional. Sometimes the best way to take charge is to delegate. On the heels of San Francisco's Arbor Day festivities, the City has announced its Urban Forest Mapping Project, which digitally pinpoints the location of each tree, maintains tree data in a consistent database, and offers web access to the tree data for maintenance and planting efforts. This is no small undertaking, and because regular folks like you and I can post photos and stories about our own trees and map them online, it's a great example of how a wiki can help us live not in a collection of gardens, but in a true landscape. Thinking of planting an apple tree and wondering whether there's a pollinator nearby? Check the map. Need to know what that monster down the street is that reseeds itself so prolifically? Check the map. The map is still in the development stages, but already it encompasses something like 140,000 trees. Check it out yourself: look up your favorite neighborhood or favorite tree... or better still, plant one yourself and add it to the database! "Even when we are trying to aid the environment, we are not willing as individuals to leave the system that we know in our heart of hearts is the cause of our problems. " "We’re willing to be generous in order to 'save the world' but not before we’ve insured our own survival in the reigning system." So writes Curtis White in the current issue of Orion magazine. I take his point painfully well: I'm becoming increasingly aware of my unique position to "aid the environment," to design not just gardens but environments that help put things right rather than add to the problems. Yet I'm driving around in an SUV that gets 18 mpg. If estimates are correct, I've sent about 20,000 disposable diapers to the landfill so far (and counting). And I can't help it: I really think landscape lighting is an important element in your yard, even though it does increase your carbon footprint. I would like to think I can help change the reigning, unsustainable, system. My job, unlike many others described by White's essay, probably has net environmental benefits. But I'm nowhere near being able to live sustainably in my own home, much less overhaul the lifestyles of my clientele who still believe they need massive lawns and impermeable paving everywhere. "We are not ready. Not yet, at least." Mark your calendars… it's time to start loading up on California native plants from the folks who know 'em and grow 'em. Growing Native, a bi-monthly newsletter by Louise Lacey, P.O. Box 489, Berkeley, CA 94701, www.growingnative.com, (510) 232-9865. I've already mentioned I don't like using peat moss, and I just discovered the research to support my disdain. In fact, Linda Chalker-Scott's debunking of horticultural myths is great on many levels: fun, informative, and even profitable if you've ever needed to settle a bet on whether pressure-treated wood leaches its chemicals (it does) or bleach is the best sterilizer for pruning shears (it's not). Then again, one myth that gets buried is that if it's published, it must be true — et tu, Linda?